Just north of Boston is Chelsea Massachusetts. 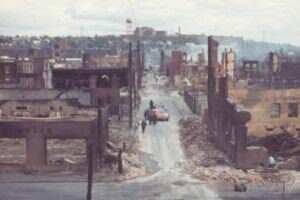 The second Great Chelsea Fire occurred in 1973. Eighteen blocks of the city were completely destroyed, with National Guard troops cordoning off the border streets to turn away spectators, and support emergency response teams. The first Great Chelsea Fire occurred in 1908. In 1971, an area of Chelsea was slated for urban renewal. This part of the city was known as the "Rag Shop District," due to many junk and salvage dealers being located there. Negative economic conditions in the early 1970s resulted in numerous businesses closing up shop forever, with many property owners just abandoning their buildings. Most of the structures in "Millionaire's Row" were two-story wooden buildings or constructed of brick and wood. At 3:56 p.m. on Sunday October 14, 1973, a fire alarm was sounded at Third and Arlington Streets. The wind was gusting up to 35 mph that day, and the fire quickly spread from Summer Street to Maple and Third Streets. The fire was out of control due to high winds, and a lack of water from leaky ancient city water mains. Aid was called in from sixty-seven fire companies from eastern Massachusetts, and one from Hampton New Hampshire. After several hours, a stand was made at Everett Avenue. The fire was controlled in a triangular area bounded by Second Street to the south, the Boston & Maine Railroad tracks to the west, and Everett Avenue to the east. Eighteen square blocks were completely destroyed, with 1000 people evacuated from the disaster area. Chelsea Fire Department Chief Herbert Fothergill had to overcome many large obstacles to battle the blaze, including high winds, low water supply, refueling of equipment, and distribution of mutual aid from other fire departments (from as far away as New Hampshire), as they arrived in the city. Fire Chief Fothergill eventually employed a helicopter to assess the nature of the fire, and develop a strategy to put it under control. In 1973, this author lived about 1-1/2 miles from the Great Chelsea Fire. The entire sky was filled with smoke, blowing swiftly to the north. There is a famous photo of people on top of a hill in San Francisco watching the fire after the 1906 earthquake; my view of the Chelsea Fire was very similar to this image. That night the sky was glowing red in a broad swath, with several small explosions observable that shot ambers high into the air. The sound of distant explosions was discernible, although with a slight delay as the light traveled faster than the sound. This author was just a kid, and the next day walked to the center of the Meridian Street drawbridge to witness the National Guard troops blocking off this road into Chelsea. The fire fighters and emergency response people did an unbelievable job in fighting this great conflagration, thus preventing a much greater disaster.